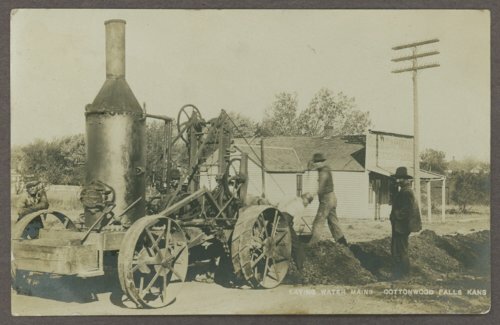 This is a postcard showing workers using a steam powered trencher to lay a wooden water main on East Pearl Street in Cottonwood Falls, Kansas. The location was a half block east of the Chase County Courthouse. The building in the background is George E. Capwell's photography studio. The postcard was addressed to Mr. Laurence Larkin in Pilchuck, Washington.